So I’ve been back home for a little more than a week now. A major weather front moved through and dumped a shitload of snow on us. Thankfully this was after I got back safely on the bike. I hope I’ll get the chance to go through these and explain them, but a big “you’ve been here before” voice says to me that I’ll be looking at this blog post in 2, 3, or 4 years and wistfully remembering that brief time I had a respite from the crazy when I could actually take pictures and explain what they were about. So now we’re on to the next thing. Yay. Finding it hard to muster an ounce of enthusiasm. Call me a bad person. Yesterday was pretty mundane. I did the dishes, finished my book, packed up the tent, etc. I had a nice Facetime chat with everybody in Minnesota. Sadly, it was getting too dark and the wifi doesn’t reach far enough to do a full walkaround. Oh, this is once I’d fixed the Internet. It’s hard to preserve things like fragile phone cables when you’re running big diggers around the property, and the inevitable happened. So after everybody left I figured out what wires to connect to what and was able to use the Internet in the evening. This morning, the guy from the phone company was here to relocate the phone box to a place where it is relatively unlikely to get clouted by a digger. Hopefully this one lasts a while. I went in via the Study Butte entrance, and was immediately faced with a choice: Asphalt or Gravel? I’d been down the Maverick road in a truck before, but that was years ago, and I wasn’t driving. Given the choice between adventure and the safe option, I chose adventure. Even though I was on a huuuge bike. That I just got. With street tires. What’s the worst that could go wrong? This may have been influenced by watching a good portion of Disc 2 of “Long Way Round” last night. I mean, Ewan and Charlie got through Mongolia, right? I came into the park from Study Butte on 118, then immediately turned south-west on the unmarked gray road at Maverick Junction. This proved to be a fairly well-graded gravel road without too much trickiness. There were a couple of wibbly-wobbly bits when the gravel got deep, but on the whole it was possible to cruise along pretty well. It was way more comfortable on the bike than it would have been in a truck, because the bike doesn’t sway from side to side. There were even a few spots that would have been ideal jumps at higher speeds, but I exercised admirable restraint and kept both wheels on the ground. GS on Maverick Road, Santa Elena in the background. The low structure is Luna Jacal. Apparently Mr. Luna lived here with a very large family and up to 12 (!) wives. He lived to 107 or 108 years old. After Maverick Road, I went to Santa Elena Canyon. The light was a bit flat but it was still beautiful. Then I headed up to the Chisos Mountains to cool down, buy some gifts, and take photos of the Window and Casa Grande. There was a very strange scooter that rolled in as I was having a rehydrating drink. It was most interesting, in a “Mad Max meets Hello Kitty” kind of way. I think it was a stripped down Yamaha Vision, though I could be wrong. This would fit well in Japan. I was surprised by the number of scooters I saw. That’s apparently now A Thing. I didn’t do much. 12 hours’ sleep, a quiet lunch, reading my book. It was nice to be a hermit. In the afternoon, I fired up the Kubota tractor and had a fine time figuring out how everything worked. Based on the other day’s demo on preventing erosion, and the fact that I’d observed some pretty good gullies forming in the area by the creek used for camping, I thought I’d have a go at seeing if I could, if nothing else, stop it from getting worse. I had a tractor, I had a stetson, I had something to fix, and plenty of rocks to do it with. Hopefully when I come back there will be evidence that my strategically placed rocks are having the desired effect and allowing the water to slow down enough to drop its sediment. As a bonus, I only got the tractor stuck once, and flicking four wheel drive to “on” got me out of that jam nicely. After that, I wandered up to the porch at sunset and chatted with a couple of nice folks about motorcycles. Bob owns this bike, and told me many tales of the cool off-road rides in the area. He’s a retired nuclear inspector, and spends winters in the Big Bend area. He’s down to 50,000 miles a year now- which he says isn’t bad for 70 years old! We all woke up relatively early and got my parents and Gilli packed for the trip back up North. A quick breakfast and a non-Minnesota goodbye, and I was on my own. I was sad to have such a short overlap with them, but that’s life. We at least had some time together and the chance to get me introduced to some of the locals. I headed up to the ghost town to grab a “Viva Terlingua” bumper sticker for the bike and scout for souvenirs for the boys. After that, I wandered down to the community garden, which was having it’s “Green Scene” event. There was a solar powered generator on a trailer that I thought was quite nifty- cleverly made from off-the shelf components with a minimum of customization, it looked ideal for off-the-grid situations. I wandered up the hill and watched a demo on the “one rock dam.” It took a few more rocks than one to accomplish what they were going for (preventing a fairly severely eroded gully from growing), but the principles were simple: Slow the water down so it doesn’t get to a velocity or volume that it starts scouring the landscape. There’s a lot of scouring going on here, as can be attested by Terlingua creek after a local rain. It turns a very muddy brown as the local topsoil has no choice but to end up in the creek. I watched the demo, fascinated by what seemed like common sense but really took a bit of art to accomplish. They showed previous years’ efforts with this technique and how the soil had begun to accumulate and allowed some of the hardier desert plants to start to flourish. He’d done a 6000 mile trip to Glacier a couple of years ago, so we chatted about that and travel and things each bike had that worked and didn’t. I’m surprised by the number of GS’s out here- I’d have to say they are probably the second most popular bike besides the ubiquitous Harleys. Next, I suited up and headed west on FM170, which is considered one of the better motorcycling roads in North America (apparently #2) . I’d ridden it back in 2009 when we did the Vision four corners tour to finish up the testing on the then-new Victory Vision. It was a fun road then, and it’s a fun road now. I’d forgotten just how technical it was- many crests where you don’t know which way the road is going to go, or whether there’s a burro or a javelina on the other side. I took it steady and still had some fun. I turned around before I got to Presidio, and headed back. Selfie with GS somewhere on FM170. Clay Henry, mayor of Lajitas. There’s a bit of a story here, and it’s hard to tell where truth leaves off and fiction kicks in. I suppose it doesn’t really matter as much out here. As long as there are enough longnecks for everybody. I will admit to being a little surprised to see “resort” and the sorts of luxury things you’d expect in Arizona or wealthy Colorado mountain towns, but I suppose gentrification strikes all over, and if the well-to-do bring more money to the area then the area should benefit to some degree. On the way back, I picked up a 12 pack of Bud Light for the construction crew, who was working, on a Saturday, in 90+ degree heat. I was happy to hear them kicking back in the game room playing ping pong when I brought the ice-cold brews in. They were very appreciative… they had earned that break. Good deed done, I headed back up to the ghost town to hang out on the famous porch. Met a couple of interesting individuals who had been coming to Big Bend for years and had many great La Kiva stories and tons of tips on what to look for in the park. We had dinner, and TJ even insisted on picking up the tab. Thanks TJ! After that, I headed back, crashed at 10pm, and woke up some 12 hours later. Apparently I needed that sleep. On Friday morning I woke up again to the “light switch sun” that we get here in Terlingua. One minute you’ve got gloriously backlit Chisos Mountains to the East, and the next you’re in full sun as the sun clears the mountains. It’s like <insert supreme being of your choice here> flipped a switch and BOOM, you’re in full sunlight. Best alarm clock I can think of. View from my tent at sunrise. Scenic camping spot, right next to the old toilet block. Now that we had some time, I got the full tour of La Kiva. I think it’s fair to say that Friday was the low (high?) point in terms of demolition. In fact, I certainly hope so! The structure has next to no roof. Some vigas remain, but many need to be replaced. All the floor inside is gone (except for the great room.) Most of the stucco walls were too rotted to survive, and one even fell down of its own accord one night. Walking around I marveled at how much work it must have taken to get to this point. Most of the wonderful woodwork has been taken down and put into safe storage. All of the decorations have been carefully preserved. The great room has been turned into a command center, and is the only part of La Kiva that has wi-fi and air conditioning. I camp out here a lot when it’s in the heat of the day and catch up on editing photos and updating the blog. After the tour I went for a walkabout on the property. There were many finds, including some rather nice camping spots. Apparently “bring back the camping at La Kiva!” is a common refrain, and I can see why. It’s a beautiful area. John cheerfully threatens me with a power tool. Luckily, he’s standing on the other side of a trench deeper than he is tall. We have an excellent relationship, provided there’s a trench there. It turns out that I arrived at a good point to be an impartial sounding board for some of the very important decisions that were yet to be made. As my parents were going to be out of town for up to a week, getting the final plan on the layout of the new construction was critical to avoid any delays. I’ll let my Dad communicate the decisions via his blog (another shameless plug, and a shout-out to my sister Joanne who does a great job keeping it updated and available : la-kiva.com ) My favorite contribution came to the floor. The question was “do you want polished or rustic?” My observation was that, when I go out drinking, I need all the traction I can get. That seemed to be a compelling argument. I spent the good part of the afternoon in the relative cool of the “Situation Room” and got caught up on photo editing and the like. Around 5pm the serious discussions started, and were settled over beer and wine at the picnic table in the shade of the RV. Once consensus was reached we headed over to Rio Bravo and had a very nice meal. That was that for the day. Crawled into my tent and did a really outstanding job of not thinking about anything related to work. Bliss. After a decent lie in (which annoyed the cleaning crew no end) I loaded up the bike and headed south. The ride was uneventful. The development around Midland and Odessa was amazing. It’s a real boom there due to the energy they are now able to extract at economical prices. My family rememberst traveling through the area in the early 1980’s when the opposite was true- the area went through some hard times. I had a brisket sandwich, which was pretty good. The sides were a little bland, but the flavor of the brisket made up for it. I think I probably was supposed to add lots of BBQ sauce, but I wanted to see what the food tasted like, not the sauce. I was pleased to note that they had left, if not all, at least some of the fat on the brisket. That really made the flavor jump out. Also, I suspect they were using some sort of vinegar-based basting concoction, because the bark was very tender and had a faintly sour and tangy taste. It was delicious. Next time I am through there I shall try with the sauce and see what I think. The drive through this part of Texas is fast, and there’s a lot going on, but there’s not much to look at unless you’re a fan of explosive development and geek out about oilfield services equipment. Not much worth taking photos of, plus I wanted to make good time so I could finally see my parents again, however briefly. The drive from roughly Fort Stockton south gets much better. The scenery gradually changes. You pass a huge pecan grove, which I’d never noticed before. By the time you get to Alpine you can tell there are mountains ahead. The drive south from Alpine to Terlingua is a great motorcycle road. Nothing very tight, but lots of higher-speed sweepers that let you settle into the corner and roll on the throttle. It’s been a long time since I enjoyed riding a motorcycle like this. Our favorite dinosaur is still in place. The Ford Model A club of Texas was visiting. Beautiful cars. This was also in the parking lot, but no cyclists were around. Then we went over to some friends of my parents and watched the stars from their back patio, which overlooks a sharp dropoff with a stunning view. Because the fifth wheel didn’t make it down, my accommodations are my tent, which is a little earlier than planned. I pitched it next to my bike in the parking lot and went to sleep. I was so wound up last night that I got no sleep at all. Despite that, It’s been a productive day. I located the local Ford dealer, who recommended a towing service. I was clear with the towing people that this was a big truck with a big camper behind it. The lady on the phone was typical Oklahoma nice: “Aww, hun, I better transfer y’all to the big boys, then… hang on, sweetie.” We were in business. They weren’t kidding. The gentleman who showed up was definitely a big boy. With a big truck. He was very friendly and worked quickly, scampering all over and getting us ready to roll in under half an hour. The initial choice of dealer fell through- they wanted us to leave the trailer somewhere as they didn’t have room. Plan B had us going to a different dealer slightly further away that had plenty of room. Some maneuvering through OKC traffic, a bit of paperwork and exchanging of phone numbers, and the truck was set to be looked at ASAP so an estimate could be made. Then, apparently doubled. Turns out the truck needs a new transmission on top of the transfer case and drive shaft. It’s a rather depressingly large number. While I was waiting for the tow truck, I scouted up the road and found all sorts of interesting bits of metal that looked like they had once been part of the transfer case. This explains some of the noises I heard. I never did find the rear part of the driveshaft, though- that should have been a very large piece indeed. On the way into Snyder, I passed through a wind farm just as the clouds came in low. It was too surreal to pass up the photos, but they don’t really do the place justice. The constant noise from the turbines gave the place an otherworldly feel, and riding through the clouds as they obscured then revealed the upper parts of the windmills was a little spooky. The cheapo motel WiFi isn’t really cool with staying connected for too long or for allowing uploads, so the pictures will have to wait until I can get a stable connection. Surreal wind farm near Snyder, Texas. I was so startled I nearly fell of the bike. Tomorrow: Terlingua, La Kiva, and seeing my parents and Gilli. Only 5 hours’ ride, and the last bit should be really pretty. Dinner at Taqueria Guadalajara was tasty. This blog has been dormant for quite a few years now. So has my photography hobby. For a while there, I was shooting about 20,000 shots a year. That fell off a cliff and went down to 800 or so in 2012. I hadn’t pulled out a film camera for a couple of years, let alone do any developing up until very recently. My last few years of work have been crazy. Many big things went sideways at critical times, and caused a great deal of stress for the entire team. Strings of late nights and long days turned us into zombies. Parts came in so badly made that the only remedy was a last-minute round-the-world trip to sort out suppliers and/or find better one. Such is the life when you’re developing something totally new and have to figure out what you don’t know as you go along. It is staggering how much we’ve learned in such a comparatively short time. I couldn’t be prouder of the team and how we’ve been able to power through obstacles and bring such a crazy awesome product to market. The icing on the cake is how well our baby is being received so far. But I need a break. As one of my bosses is fond of saying, “You don’t write very well with a dull pencil.” I missed most of the summer due to a neverending cascade of crises du jour, and even when I did get a weekend I was useless. Going to the gym slipped, eating healthy slipped, riding my bicycle slipped. I barely found time to get the grass cut. My sense of humor was gradually being replaced by a deadpan seriousness that I hated but had no spare energy to do anything about. Clearly, I had to carve out some time to destress and shake the cobwebs out. My parents are coming out of retirement, and have bought one of our favorite restaurant/bars… La Kiva, in Terlingua, Texas. That’s 1550 miles away from where the family lives. They’ve been down in Terlingua coordinating what is turning out to be a massive restoration/rebuilding effort to restore everything to its original glory and also comply with little things like health and safety codes. As I type this, I’m in a hotel room in Edmond, Oklahoma. This is not planned. I’m a little more than halfway to Terlingua. My motorcycle is parked outside. The truck & trailer didn’t quite make it. Everything went fine for the first 500 miles or so. As the drive went on, I became aware of a vibration from what seemed like the right front tire. At first, it was only noticeable going down hills at 70mph. Checking the tires at the next gas stop yielded no information. Nothing was hot, there was no play in the wheels- I couldn’t tell what was wrong. Finally, when the vibration crept down to 60mph I pulled into a gas station. I checked pressures- right front was a bit high, so I aired down. It was also showing signs of cupping, which I thought to be the source of the vibration. Pulling back onto I-35 with the intention of putting in maybe another 10 miles to get to a decent truckstop to stop for the night, I heard one of the nastier mechanical sounds I’ve ever been witness to. It was horrible. The truck jerked and bounced around and I lost all motive power. I pulled over to the side of the road and coasted to a grinding, banging stop. The front driveshaft looks to have been the culprit, or at the very least a victim of the root cause. It is severed about halfway along its length. The transfer case appears to have exploded quite nastily. The transmission is stuck in Neutral. Transmission fluid everywhere, and several important looking mechanical bits are exposed in a “that ain’t gonna buff out” kinda way. Obviously, I needed a way to get to a hotel. Luckily I have a new-to-me BMW GS1200 Adventure in the back of the fifth wheel. All that needed doing is roughly an hour of unloading, packing, repacking, and donning riding gear. Then the bike wouldn’t start. Push bike to front of truck. Unlock truck. Open hood. Go to back of truck. Find jumper cables. Jump bike. I felt a bit like that guy in the Viagra commercial, where he uses the draft horses to pull the truck out of the mudhole. Only there was no mud, horses, or Viagra involved. Unloading the motorcycle in the middle of the night. Luckily everything worked okay after that. Plug in GPS, hit “Hotel” and ride the 4 miles to a nice Hampton Inn in Edmond. I’m safe and sound in a nice comfy bed (and Hampton Inns have the best beds and pillows.) I felt compelled to write this out of sheer incredulity while it’s all fresh in my mind. Seriously- I go on a vacation to get away from things failing unexpectedly, from having to problem solve anything and everything you can imagine, from having late nights and uncertainty and stress… and this happens? Privately, though- I’m kind of pleased. I haven’t thought about work since the truck blew up… and that’s something. With a camera, that is. Joanne, through her connections at the U (she works in a design-ey environmental-ey thingie on the St. Paul campus, which she loves) was asked to do some crowd shots before and after the talk, and asked me to help. This actually turned into a game of taking pictures of each other taking pictures of other people. I caught her taking pictures of some friends, so she repaid me by photosniping me from the balcony. I was shooting the M9 with a 35mm Summilux, she was shooting my Nikon D7000 with an 18-200VR. I had the equivalent of a bolt-action target rifle, and she had the AK-47. Anyway, the talk was wonderful. Dr. Rosling is an entertaining speaker, even when talking about such moribund topics as cancer, healthcare, death, overpopulation, and the like. He was so dynamic, vibrant, and full of life that it was energizing just being in the audience. Plus, I learned a thing or two. The video of his talk will be posted in a couple of weeks. I am raw. 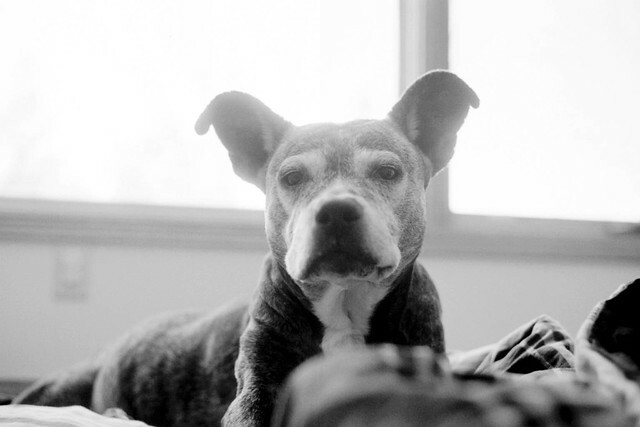 There’s a hole inside of me roughly the size, shape, and weight of an elderly American Staffordshire Terrier we called Zoe, and not much will make me feel better right now except maybe writing this and remembering all the happy times I had with her. First, I should establish that I had her put down today slightly before 5pm. The vet was professional, and the procedure (a massive overdose of barbiturates, like Marilyn Monroe but without the conspiracy theories) was peaceful and painless for Zoe. She simply slid off to sleep. It was actually a relief to hear her struggle end in peace. No more labored breathing, no more groaning. Zoe was a tough, tough dog who didn’t show pain easily. That she was groaning as she labored to breathe or moved around says a lot about what she was going through. She had a growth next to her kidneys or spleen (the vet wasn’t really very sure on which), but the consequences of the operation given her age and condition were likely to make her full recovery unlikely. We elected not to put her through the whole ordeal, and instead focused on making her as comfortable as we could. In the last week she’d really started to go downhill, and had begun to have trouble sleeping. Today, after conferring with the family, I elected to end her suffering and say goodbye. It should go without saying that this was one of the harder things I’ve ever had to do. So, that’s got me torn up 10 ways from Sunday, and second guessing everything, for all the good that will do now. 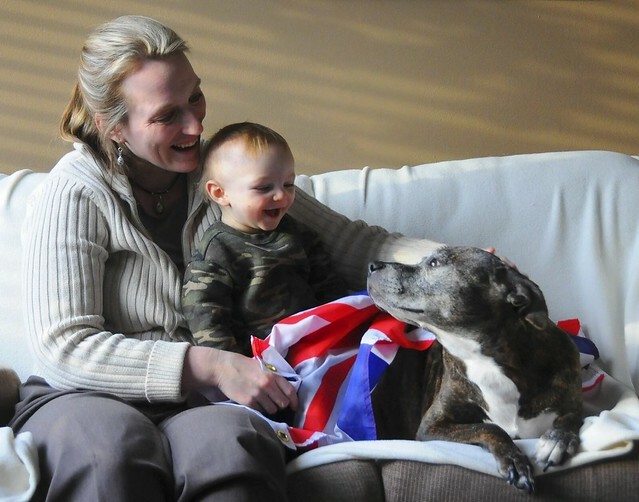 I had grown up with Staffordshire Bull Terriers in England, and had fond memories of all of them. They belonged to my Aunt Gillie, and I knew that they were the kind of dog I wanted to own. So I called on this number, and got no response. I kept calling and explaining that I was serious and that I knew all about these dogs and that I really wanted to meet this Am. Staff, brindle. We brought her home, and she trotted around the house with her head up, tail wagging, as if realizing that she already owned the place. We named her Zoe, because her personality reminded us of a person we knew, and she quickly became part of our life. First order of business was a bath, which she took great offense to. She stuck her head in the corner farthest from the showerhead and made a plaintive yowl I will never forget. But we got her clean and smelling better. She filled out quickly, we got the mange taken care of, and her coat rapidly turned into a beautiful shiny brindle. The first night, I was resolved that she would sleep in her crate, next to my bed. She was resolved that she would sleep in the bed. Under the covers. In the middle. She turned out to be more stubborn and persuasive than any other being of any species I’ve ever met, so the spot in the middle, under the covers (if it was cold) was what she got. This would prove to be interesting when I had company, but we worked it out. She chewed a lot, but a liberal supply of toys meant that not too much got damaged. When she was little, her favorite target was the trash can. She hated the crate, but we used it to minimize the number of messes while we were out. 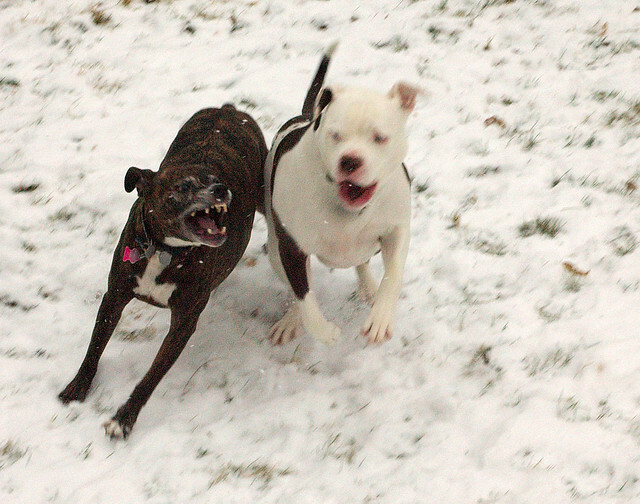 Throw the frisbee NOW, dammit! Her favorite pasttimes were snuggling, frisbee, and tug of war. She was fierce and committed to all three, and excelled at them. She lived with me in Minnesota, California, Wisconsin, Minnesota, Wisconsin, and Minnesota. She moved with me 7 times, including one epic trip driving back from California where we got stuck in a blizzard in Wyoming. I spent the night in the car with her to keep her warm, as I couldn’t bring her into the motel. She traveled across too many states to mention, including one memorable road trip to South Carolina to see a friend graduate from basic training. She didn’t think much of that particular trip, particularly when the alternator on the Subaru went out and stranded us in the middle of nowhere, Kentucky. She joined me trail running, mountain biking, whitewater kayaking, cross-country skiing, snowshoeing, and camping. She once singlehandedly invented the sport of canine base jumping, and lived to tell about it. She carried her own gear while backpacking. She was fierce in the ocean, and would happily dive into killer surf as long as there was something thrown in to retrieve. In her prime, she could cover 10 miles in an hour on one of my favorite mountain biking trails. Zoe had good people instincts. She once saved Megan from a guy who was stalking her, and who raped somebody that night. He knocked on the door late one night and Zoe would not stop growling. Megan didn’t like the way she was growling, and didn’t go to see who was at the door based on the sound alone. I was out of town and was incredibly grateful. There was never a cross word with any of our friends… she seemed to know already who belonged to the pack. She loved nothing more than a houseful of people. Thanskgiving was her favorite holiday. She was an ambassador for the breed. When we moved to Stillwater, curtains twitched and the neighbors told their kids to stay away from her, as they thought she was dangerous. Well, one of the kids didn’t get the memo and ended up meeting her (under supervision, of course), then playing frisbee with her in the side yard one afternoon. By the end of that week, the entire neighborhood of kids swarmed her as we let her out in the evening, to the point where we had to institute the “no frisbee before Zoe pees” rule because she was getting too distracted to do her business. She was endlessly patient with the children, and loved them both dearly. She took the role of “dog mom” seriously. Zoe, I will miss you more than I can ever begin to express. The last 14 years you have shared with me were amazing… we did so much together, and the whole time you were there for me no matter how much crazy stuff had happened. Rest in peace, my old love. Good girl. Good girl.